In the beginning, there was water. Along with oxygen, it is a crucial element to living. We take it for granted until there isn’t enough or there is too much. 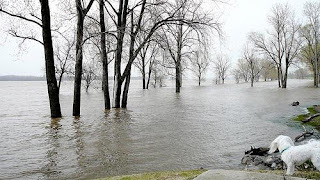 Several times the Mississippi River has illustrated the results of excess water. Farms and livelihoods are destroyed by the very substance that sustained them. There are scientific reasons for floods based on weather patterns, but experts are also saying that part of the problem is man. For centuries we have yearned to tame our landscape, often upsetting the balance of God’s creation. There is a reason why the soil is so fertile in those states along the Mississippi. At one time the Mississippi was unhindered, free to run over its banks, washing the earth with rich nutrients. Of course, the world has gotten older and more crowded increasing the demands on God’s creation. We see land under water that could be used for our benefit and so levees are built to hold back its powerful weight. We then plant and grow and build, attempting to supply the ever growing demand of the world’s citizens. When God’s Spirit brooded like a bird over the waters I wonder what He envisioned. Surely he knew what would transpire once the watery abyss was divided and man would seek to control what God had set in motion. God doesn’t cause floods. But, they do remind us that in the beginning God designed his intricate creation with details meant to work together, harmoniously.Our mistake with the earth, as in many areas of our lives, is that we try to seize control and end up creating chaos. God, thank you for creating the worldto work in balance. You created order!